So you would like to see some Hippos but your not sure where or how. Well St Lucia, KwaZulu Natal is a small quaint village situated on the North Coast of Zululand. Population of permanent residents is plus minus 500 while the Hippo population is approximately 800. These permanent residents (Hippos) have taken to the ways of the villagers they come and go in unison without as much as a yawn or show of aggression. They are simply interested in the most valuable commodity that the town has to offer and that is Grass. Home owners with small or large lawns have gone as far as dropping their fences merely to have these incredible creatures visit them by night. This scene takes place virtually each and every night providing of course that your lawn makes it onto the list of places to enjoy a treat. It's such an incredible sighting when they arrive some with youngsters while others it would seem are loaners or maybe better yet not interested in sharing their discovery. Merely a bark of a dog in the distance signals the arrival of the Hippos as they continue their journey past in almost absolute silence. Their is order in their grazing they know how much to graze and then move to the next pasture. Just as soon as they arrived in complete silence they disappear into the darkness. This incredible and magnificent sight is truly cherished by all who reside in this coastal village. Visitors are of course warned as to their presence be it with a slight grin (mmm a tale i'm sure). Clients are warned not to approach the Hippos but rather keep their distance should they be walking to and from town during the evening. Or should they be driving to also keep their distance take pictures and move on. As one can imagine their's always a cue behind them wanting to confirm the sighting. St Lucia is absolutely the best place to view Hippos not only in their natural habitat but wandering the streets, how bizarre taking into consideration that Hippos do cause the most deaths (human) throughout Africa. Why one may ask do they contribute to such fatalities throughout Africa then. If their is one rule when it comes to Hippos then it is not to confine their movements, if they feel at all that they are not able to return to the water they may or will probably attack. 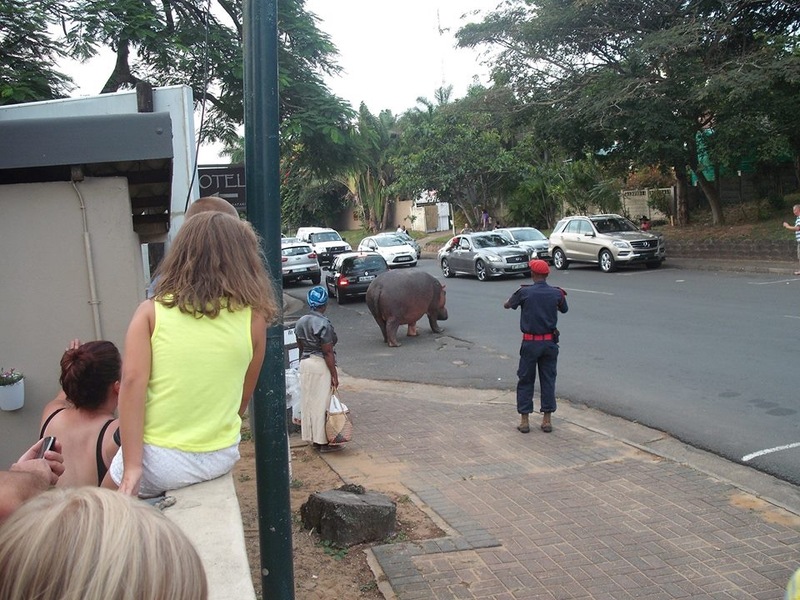 On numerous occasions more than I personally can count I too have seen the Hippos walk though town in broad daylight. This as one can imagine causes absolute chaos. People being human wanting to get that selfie with a live Hippo in the background. Ironically the Hippos go about their own business without incident. Should you too get the chance to witness the Hippos in Town please at all times remember that they are wild animals keep your distance and cherish this amazing sighting. Want to see the Hippos in their natural environment well one has various ways of doing this as well. 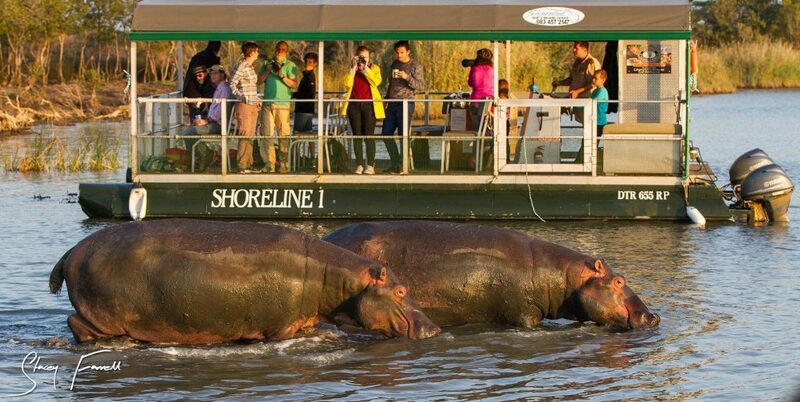 One of the ways would be to join Shoreline Boat Safaris that depart daily every two hours on a Hippo & Croc Boat Safari. Alternatively one could drive down to the St Lucia Ski Boat Club and enjoy the wonderful views of Hippos all the while enjoying a tasty treat. Take a walk over the St Lucia Bridge and you too will be rewarded with a great sighting of Hippos. Once again St Lucia is the Best Place to View Hippos, always respect the wildlife and enjoy. Yes it's true, you too will see these incredible creatures grazing on the grass while in Town. Each evening Hippos leave the estuary and go insearch of grass, take a slow drive around town and you too will be amazed by this incredible sight. What an incredible sighting, seeing Hippos wondering down the main road of St Lucia. Although this sighting is not an every day one it still occurs and when it does I assure you that you to will get those cameras out. Please keep your distance at all times. 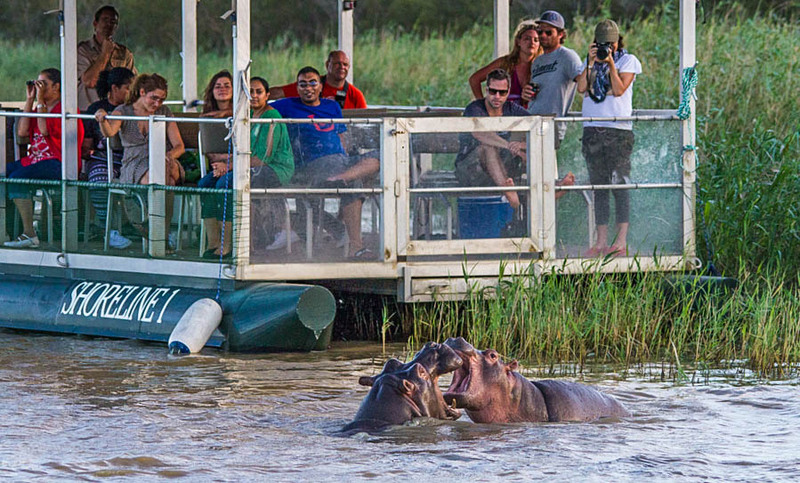 The St Lucia Estuary has to be thee best place to view Hippos while in South Africa. Home to more than 800 Join us and see this magnificent sighting while out on a Hippo and Croc Boat Cruise. Trips depart daily every Two Hours.